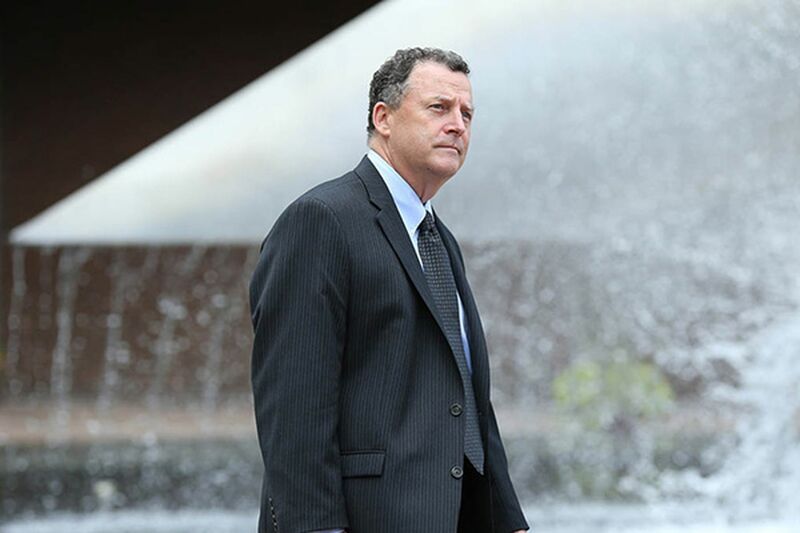 TWO WEEKS AGO, former Traffic Court Judge Robert Mulgrew may have been breathing a little easier after a federal jury acquitted him of major charges related to an alleged ticket-fixing scandal, although the panel found him guilty of perjury. While Mulgrew, 57, doesn't yet know what sentence he will receive in that case for having lied to a federal grand jury, he learned yesterday that time behind bars will be part of his near future. U.S. District Judge C. Darnell Jones II sentenced Mulgrew to 2 1/2 years in federal prison for defrauding a South Philly nonprofit that he had helped run. "Too often, we are of the mind that public corruption exists, so what?" but that needs to change, the judge said. Mulgrew was vice president of the now-defunct Friends of Dickinson Square. From 2002 to 2008, he fraudulently spent state grant money from the Department of Community and Economic Development given to the nonprofit to purchase equipment and materials to improve his Pennsport neighborhood in South Philly. Instead, he used some of the funds to pay his relatives and associates for work that was not done and for personal expenses, including $46,000 to lease pickup trucks and to buy an $827 camera and to fuel up at gas stations. The prosecution and defense agreed that the total fraud loss of state grant money was $199,274. The judge ordered Mulgrew to immediately reimburse that amount to the state. Assistant U.S. Attorney Paul Gray told the judge that the "sustained six-year parade of thefts and corruption needs to be punished - and severely." As an example of the thefts, Gray said that Mulgrew had paid tens of thousands of dollars to two permanently disabled friends of state Rep. Bill Keller, a Democrat who represents part of South Philly, for work they did not and could not do. Keller yesterday did not return a call from the Daily News. Prosecutors have not disclosed whether they have investigated him in this case. He was not charged. Gray also said Mulgrew stole $37,000 of the state funds after he became a Traffic Court judge. Before becoming a judge in January 2008, Mulgrew was an employee of Local 98 of the International Brotherhood of Electrical Workers, headed by the union's business manager, John Dougherty. Frank Keel, a spokesman for Local 98, told the Daily News in a statement yesterday that "Dougherty has great empathy for what Bob and the Mulgrew family are going through right now and is keeping them in his thoughts and prayers. John knows Bob Mulgrew to be an honest, hardworking, salt-of-the-earth and a great family man." Keller had participated in neighborhood-cleanup efforts with Mulgrew when the Friends group formed in the 1990s. Keller's office had at times in the late '90s obtained state grants to fund the Friends group's volunteer efforts, the federal indictment said. The indictment said that Mulgrew and co-defendant Lorraine DiSpaldo, who was Keller's chief of staff, took control of the Friends group and that both misused the state grant funds by creating "make-work" projects for people they fraudulently paid and by using money for their own benefit. As vice president, Mulgrew signed the grant contracts with the state. DiSpaldo, 59, is in prison after being sentenced in November by Jones to 18 months. She began serving her sentence Jan. 7. Jones yesterday allowed Mulgrew to delay his prison sentence until Sept. 2. Mulgrew's attorney, Angie Halim, told the judge that her client's oldest daughter is expecting twins this month. Mulgrew's four adult children told the judge that their father led a good life by example. Jacqueline Cosgrove, 35, the eldest daughter, said that in a recent visit to Tyler State Park in Bucks County, her father started picking up trash left by others. Her 3-year-old son asked him why he was doing that. "Because we have to keep it clean," her father told his grandson, who then decided that he, too, would pick up trash, she said. City Councilman Mark Squilla, of South Philly, told the judge that he had often seen Mulgrew and the Friends work crew cleaning the neighborhood. And neighbors of Mulgrew told the judge that he cleaned abandoned lots, removed graffiti from buildings and shoveled neighbors' cars out of the snow. "Mr. Mulgrew in his safari hat was a fixture" in the neighborhood, wearing his "dirty jeans and boots," Halim said. She said that about 150 people wrote letters of support for Mulgrew. Mulgrew said: "I am very remorseful for my actions. I have caused undue pain to my family." He apologized to the community. DiSpaldo had pleaded guilty in April 2013 to 36 counts, including mail fraud and wire fraud. Mulgrew and his wife, Elizabeth, faced trial in September. She did not face fraud charges, but faced charges with him on filing false joint tax returns. On the second day of their trial, Mulgrew pleaded guilty to one count each of mail fraud and filing a false income-tax return in exchange for all charges being dropped against his wife. Mulgrew yesterday reimbursed the IRS $123,314, which includes the tax loss, interest and penalties.